The tap in the picture below has bugged me for the last four and a half years. 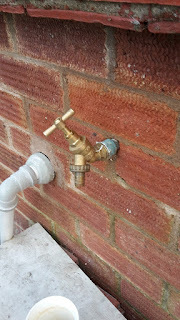 This is because previously it was upside down, nothing would connect properly and hose pipes would kink. Of course it's easy to put a job like that off. I've had the washer on the shelf for three of those years but never got round to it. So Friday night I had a spare half hour and decided to tackle it. I lay down on the kitchen and contorted myself into a weird shape with an outstretched arm to get to the stop tap under the kitchen units. I then shouted my wife to come and put the tap on and tell me when the water was off. I should be able to tell which way is on and off fairly easily (righty tighty - lefty loosy and all that) but whether it was the angle my body was at or something else I turned it the wrong way. This (although she denies it) coupled with my wife's dry sense of humour meant that as I turned the tap the wrong way, my wife also turned the kitchen tap off, making me think I'd turned the water off. She then said nothing as I went outside with some spanners and took the tap off the wall. I got blinking soaked and couldn't figure out why the water was still coming out! I thought it was just what was left in the pipes to start with. I then had to get back under the kitchen units to actually turn off the tap once I figured this out (the other way this time!). Before going back outside and changing the tap for a new one and adding a washer to turn it the right way round. Good job it was a hot day! Something I should have done years ago as it only took about half an hour! Who else has a job they've put off for ages? Who else's partner has got them into trouble like that? I'm with Dawn there! Maybe it was just payback time as Mrs EH too had to wait four and a half years. There are some jobs that fall into the category of 'that could go horribly wrong' ones. Water and plumbing tend to be those. We are always happy when one of those ends up being straight forward. isn't it funny the tasks we postpone doing? My neighbour is a kitchen/bathroom fitter and offered to put me an outside tap in for a small fee........that was nearly 2 years ago and periodically i have mentioned it to him, he assures me he will get it done soon, even gave me a tap with the piping attached which, is sitting in my pantry! I'm tempted to take it back and say I'll get someone else to do it!